To date this is one of my favorite pieces. And these pictures do not do it justice. Unfortunately we could not make it to our photographer due to time restraints. But we were able to show it off at a show in Denver and deliver to our customer. This bed and nightstands was created for a long time customer that strayed from her normal choice of mesquite wood, to have something that really stood out. 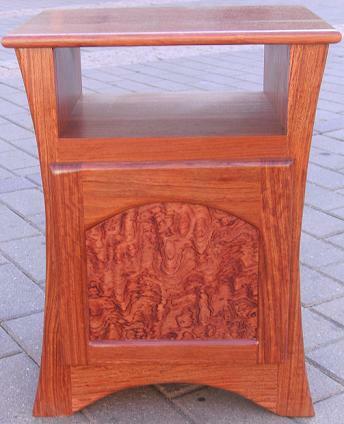 It was made from a beautiful exotic wood, Bubinga, with highly figured waterfall bubinga veneers on the panels. The footboard mirrors the headboard, but a little shorter. Long rails of bubinga were used to place the mattress on. The nightstands were designed around our customers needs andwe were given design leeway to make any modifications we felt necessary. The nightstands had the same veneer on the door fronts and a similar shape to tie them into the bed. 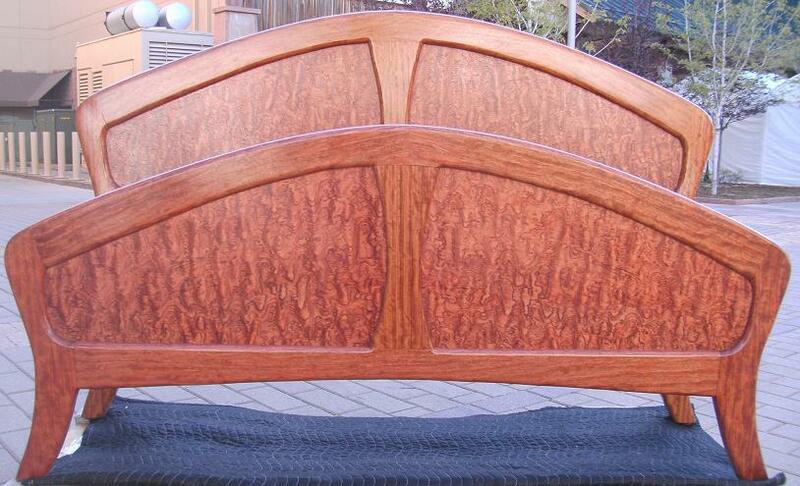 This bed was a queen size, but can be made any size, with design modifications to fit any needs and any type of wood. We hope to make this same style out of mesquite with possible curly maple veneer for the panels for our mesquite festival show in TX. You are currently browsing the Shangrilawoodworks's Blog blog archives for September, 2010.